Fulton Mayor Jimmy Kendrick told the House Appropriations Subcommittee on Disaster Impact and Recovery that he’s had suicidal thoughts as he tries to lead his city through its recovery from Hurricane Harvey. 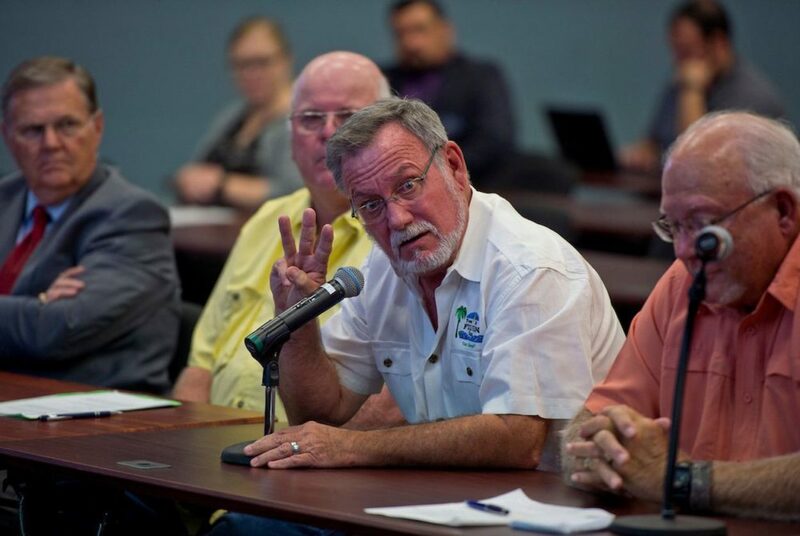 Coastal Texas officials whose counties and cities bore the brunt of Hurricane Harvey’s deadly blow this summer unleashed a barrage of complaints about recovery efforts at a Texas House subcommittee hearing in Corpus Christi on Wednesday. The mayors and county leaders voiced frustration — and one shared a vivid account of suicidal thoughts — stemming from what they described as a woefully inadequate federal response to the storm’s vast destruction. With winter coming, they told stories about residents still living in tents and hotels more than two months after the storm battered southeast Texas. Their criticisms were largely focused on the Federal Emergency Management Agency, which is in charge of initial recovery efforts. “They rank high on promises and way low on promises kept,” Port Aransas Mayor Charles Bujan said. FEMA officials did not immediately respond to requests for comment Wednesday. The local leaders also told the Texas House Appropriations Subcommittee on Disaster Impact and Recovery that the state has not funded all communities’ relief efforts in an equitable way, an apparent reference to $50 million Gov. Greg Abbott gave Houston after a public dispute with Mayor Sylvester Turner. And although the storm impacted communities across a wide swath of the state differently, they said one immediate need stands above the rest: securing more temporary housing for residents who will spend years recovering. “You can’t rebuild a community unless your citizens have a place to live, and our citizens don’t have a place to live,” said Nueces County Judge Loyd Neal. Their comments come on the heels of housing advocates and experts expressing worries that state leaders’ push for up to $121 billion in federal recovery moneyis focused more on public works projects like flood control than on individual assistance like rebuilding Texans’ flooded houses. More than 886,000 Texas households applied for some sort of disaster aid after Harvey swept through a large swath of the state. As of last week, more than 51,000 southeast Texans were still displaced and living in hotel rooms, according to FEMA data, and at least 26,000 are handling temporary housing on their own, which could include living in damaged homes, staying with loved ones or paying for short-term housing needs out of pocket. The state says more than 7,000 families still need government-subsidized temporary housing such as apartments or trailers while their homes are rebuilt. Mayors and county officials on Wednesday issued several criticisms about the bureaucracy residents must contend with as they seek immediate disaster aid. “These people have gone through four steps and still don’t get any help,” said San Patricio County Judge Terry Simpson. He also said that residents will begin the process with one FEMA worker only to have another one give them different instructions or explanations about aid qualifications or requirements weeks later. Bujan said more than 100 residents in Port Aransas lost their homes and only five families have been approved for temporary trailers. The hearing also featured state and local education officials detailing the high cost of displaced students and damaged school buildings. City, county and school officials also told lawmakers they expect to also face extreme budget woes once the value of damaged properties are reappraised and tax revenues plummet. Fulton Mayor Jimmy Kendrick drew a spattering of applause after he testified that the stress from trying to recover with inadequate federal response keeps him from sleeping some nights. He said frustrated residents have focused some of their ire on him, lobbing unfounded accusations about him on social media. “There’s been times I’ve sat there and thought about putting a gun in my mouth and pulling the trigger,” he said. Abbott split long-term recovery into two initiatives, each overseen by a different state entity vying for limited federal funds. A commission headed by Texas A&M University Chancellor John Sharp is focusing on securing money for infrastructure projects. 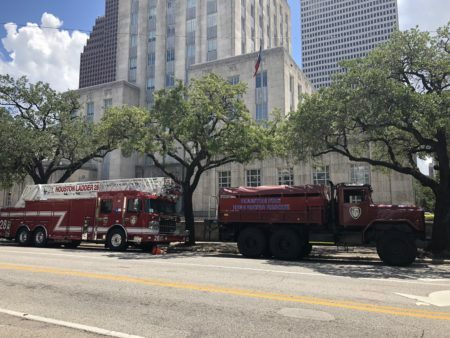 The Texas General Land Office is spearheading efforts to find temporary housing for displaced Texans and also plans to oversee billions in federal dollars that will help them rebuild or renovate their homes. But the land office is also seeking money for infrastructure projects — and doesn’t want the federal Housing and Urban Development department to limit how much long-term disaster relief money can be spent on public works projects versus housing recovery. “The key to this is not thinking of it simply as rebuilding, but rebuilding to prevent damage from future storms and thus make Texas more resilient,” said Brittany Eck, a land office spokeswoman. Land Commissioner George P. Bush said at Wednesday’s hearing that helping Texans is of primary importance. But he also said recovery money should be used to protect economic development and the private energy industry from the next disaster. “We can’t lose sight of long-term resiliency,” he said. Abbott’s two-pronged approach is similar to the state’s playbook after Hurricanes Ike and Dolly. But housing advocates complained about how the state handled those funds, and HUD eventually forced Texas to rework its plans for the money and required more spending on housing for lower income residents. Nearly 10 years after those storms, more than $500 million in disaster relief funds remains unspent. About $297 million of that is earmarked for housing. Local officials on Wednesday also complained that FEMA says privacy laws prevent the agency from sharing why individual residents are declined assistance or asked to provide more information. “We can’t exactly share the criteria by which applicants are being declined,” Bush said. As his agency begins steering those approved for short-term assistance toward five different federal programs, Bush said he has lobbied for a moratorium on home foreclosures in impacted counties. He also suggested that his office’s hands are tied on some matters by an “extensive, voluminous” agreement with FEMA to oversee short-term housing programs.